The Chicago Transit Authority (CTA) awarded a contract to Parsons Brinckerhoff to provide construction management services for transit projects throughout its system. Under this on-call contract, Parsons Brinckerhoff will provide construction management services in all phases of project delivery from preconstruction through close-out. The scope of services includes project management, project controls, safety oversight, office/field engineering support, inspection and quality assurance for the assigned projects. The first projects authorized under the contract are the south Red Line track renewal and station improvements projects with construction costs of $220 million and $44 million, respectively. 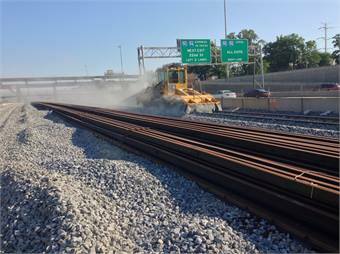 The track renewal project involves the complete reconstruction of track along the Dan Ryan branch of the Red Line, a stretch of nearly 10 miles in length. The work also includes rehabilitation of portions of the CTA Orange Line and Green Line tracks directly adjacent to the Red Line work. Under the station improvement project, eight passenger stations along the south Red Line branch will be rehabilitated with improvements ranging from basic aesthetic enhancements to additional customer amenities, including the rehabilitation of various architectural, civil, structural, mechanical and electrical elements. New elevators will be installed at the three stations, making the entire south Red Line fully accessible to all. Both projects have very aggressive schedules with the majority of construction to be completed in less than five months. Once completed, these two projects will provide CTA customers with faster, safer and more reliable service to the south side of the city. That will stimulate the local economy, resulting in new businesses and jobs for the area. The work is part of Mayor Rahm Emanuel’s Building a New Chicago program, which is updating infrastructure that is critical to the city of Chicago. In addition, all CTA rail stations now feature electronic screens displaying the agency’s Train Tracker service, a plan intended to improve the customer experience. The project was completed ahead of schedule. Last week, CTA installed the screens at the Madison/Wabash Loop elevated station, completing an installation program announced last year and scheduled for completion by Labor Day 2013. The new display screens are the latest generation of CTA digital signs, showing estimated train-arrival times from CTA Train Tracker, as well as time and temperature. 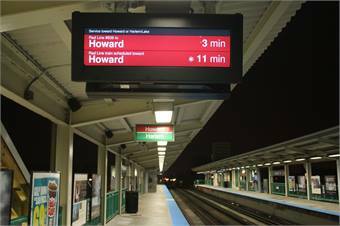 With this recent installation, the rail system now features 475 display screens offering CTA Train Tracker information. Efforts are underway to equip all CTA stations with multiple displays, with work expected to continue through 2014 for a total of at least 1,000 new CTA Train Tracker displays. Installation of the displays is occurring as the CTA upgrades station and platform technology capabilities that can support a new and improved public address system and newer security cameras. CTA Train Tracker provides estimated trains serving all stations across its eight rail lines. Estimated times are generated through a combination of scheduling information and data generated by software that monitors the signal system to indicate when a portion of track is occupied by a train.